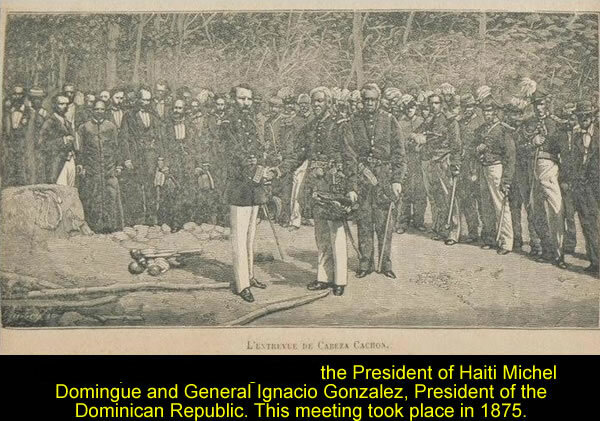 This is a meeting between President Michel Domingue and General Igracio Gonzalez in 1875. One of his first moves as president was to appoint himself a public function manager. In the capacity of the President of the Council of Secretaries of State, Septimus Rameau became, in essence, the true president of the country while Domingue was considered largely a figurehead. Another of Dominique's earliest acts was to sign an agreement with their neighbors, the Dominican Republic, stating that both nations recognized the other's individual sovereignty in an attempt to stop many years of conflict. To this end, it was Septimus Rameau who dealt with the Dominican president, Ignacio Maria Gonzalez. President Domingue's chief of staff was sent in his stead to make preparations for the agreement. Soon, the issues of fraud and corruption, though not that of the administration, caused moves that would lead to Septimus Rameau being assassinated following accusations of having two generals killed, and Domingue himself seeking refuge in the United States embassy before gaining asylum as an exile in nearby Jamaica. He would die a year following the 1876 end of his term as president.